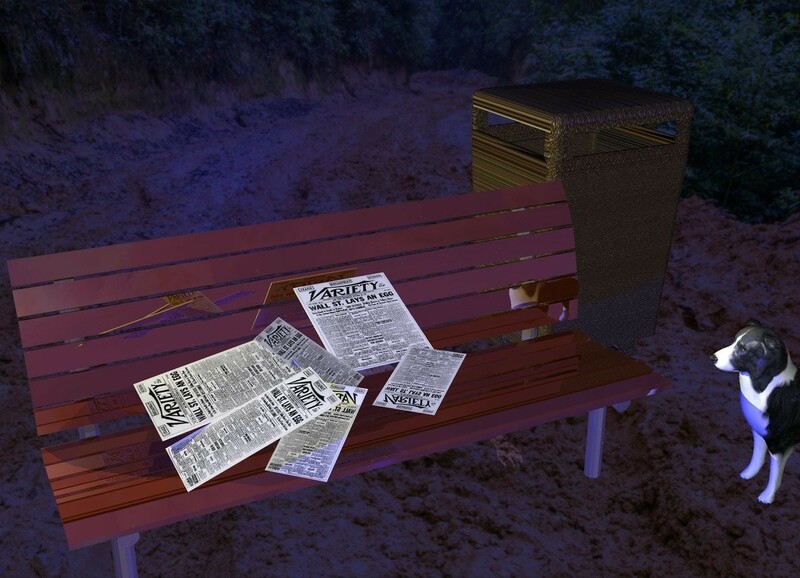 Input text: A small invisible man is on a dark shiny bench. A [newspaper] paper is on the man. It is leaning forward. A [newspaper] paper is left of and in front of and -2 inch above the paper. It is leaning 60 degrees to the back. It is facing southeast. A [newspaper] paper is -3 inch left of and -4 inch above the paper. It is facing east. It is leaning 10 degrees to the back. A 6 inch wide [newspaper] paper is in front of and -3 inch above the paper. It is leaning forward. It is facing west. A [newspaper] paper is -6 inch right of and -6 inch in front of the paper. It is facing northeast. It is leaning 70 degrees to the front. A [newspaper] paper is -1 inch right of and above the paper. It is facing southwest. It is leaning 95 degrees to the front. The sun is navy. A yellow light is above and left of and behind the bench. A blue light is in front of the bench. A [metal] trash can is right of and behind the bench. A small dog is right of and in front of the bench. It is facing the man. When I saw it in the gallery, I guessed it might be an invisible man. :-) Nicely done and a poignant statement.